If you want to express your feelings without words, this will be the way. It’s a sonnet about temptation, passion, jealousy and absolute adoration. * The recipe for the lobster broth can be found in MAZA September Issue - Spaghetti with Tomato-Lobster Sauce. ** Before shaving the truffle, grind the outside with a zester grater and preserve the powder in a glass jar. It is great to use in soups or when you make an omelet. 1Heat 1 tablespoon olive oil in a saucepan over medium heat. Add the minced sweet onion and cook until soft, about 2 min. Pour the Prosecco and mix well with onion. Add the lobster broth and the heavy cream, lower the heat and gently simmer for 10 min. 2In a medium size saucepan heat 1 tablespoon of olive oil. Sauté the onion for 2-3 min. Add the rice, pinch of salt, freshly ground black pepper and thyme. Cook until rice gets translucent. Lower the heat and gradually add the water, ¼ cup at time and stir with a wooden spoon. When the water is absorbed, add the other ¼ cup water. When it is also absorbed start adding gradually the Prosecco-Lobster broth – ¼ cup or less at a time. Stir the rice all the time until creamy and dense. 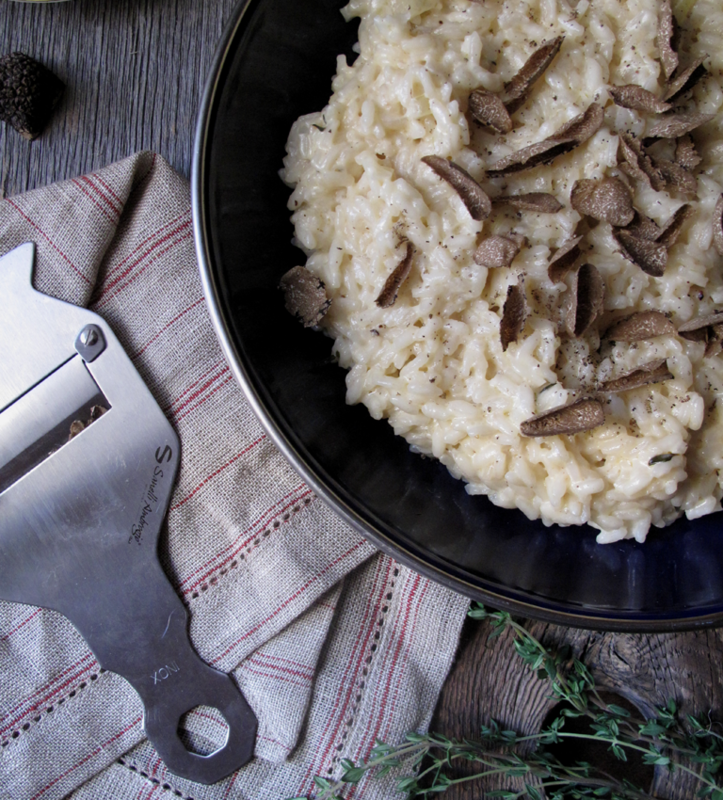 3Place the steamy risotto in a serving plate and shave on top winter fresh black truffles.